Alan Turing was a British mathematician who both broke the infamous Enigma code, enabling Britain to stay alive during WWII, and also the father of computer science and artificial intelligence. He's the reason why people have laboured for decades to beat the 'Turing Test', and also the reason why submarines didn't break the UK in 1942. Sadly, he also lived in a country which, at the time, criminalized homosexuality, and ended up chemically castrated by the British government in 1952. He committed suicide two years later with a cyanide-laced apple. Turing's life is superbly detailed in Andrew Hodges' book, Alan Turing: The Enigma, which is now also an Oscar-nominated biopic starring Benedict Cumberbatch. But actual material penned by Turing himself is hard to come by — hence the excitement surrounding the upcoming auction of one of this notebooks. 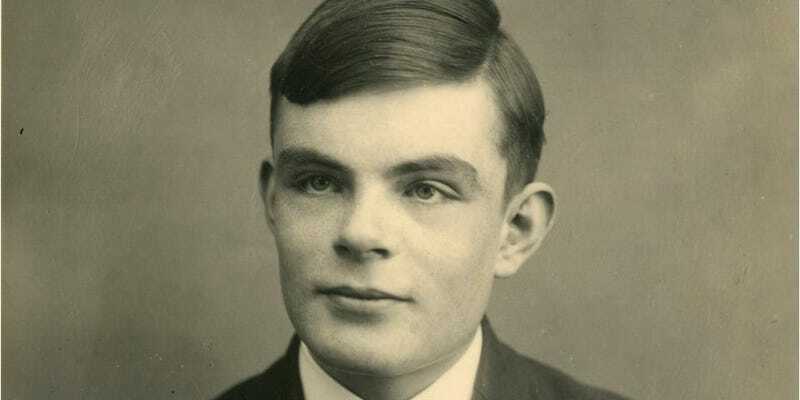 According to Bonhams, the famed London auction house responsible for the sale, the book is "a key handwritten scientific document by Alan Turing in which he works on the foundations of mathematical notation and computer science". It dates from 1942, during the heydey of Bletchley Park and the code-breaking efforts, but is more concerned with theoretical work than any application to cracking the Enigma code.